Like 15 "X-Files" rolled into one, Strange Encounters by ufologist and journalist, Curt Sutherly, shares gripping stories that run the gamut from monster sightings to UFO cover-ups. Strange Encounters confronts the unknown head-on, probing some of the inexplicable mysteries that will intrigue you, haunt you, and even frighten you. The remarkable yet true events documented here indicate a striking pattern of strange occurrences you will not be able to dismissor forget. ·Why do probes to Mars vanish? Is there some "great galactic ghoul" that devours them? ·Before the Russian "Fobos 2" probe stopped functioning, it showed a massive system for heat generation, an invisible object which cast a shadow, and an object in space that cannot be identified. What is the meaning of all these discoveries? ·What is the truth about the MJ-12 documents that purportedly reveal that the government knows much more about UFO's than it admits? ·What is the nature of the "phantom panther" that is seen all over the U.S. East Coast? ·What happened to the "mothman," a strange, human-sized creature with bat-like wings that terrorized West Virginia? ·What are the secrets of the Abominable Snowman? ·What is the truth about the Bermuda Triangle? ·What are the real beginnings of the UFO controversy? 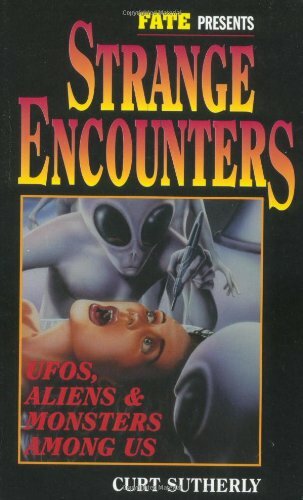 Strange Encounters is one of the most exciting books covering important events from the world of the strange and paranormal over the past 50 years. Rather than tell you what to believe, it gives you information from all sides of each strange event and lets you decide for yourself. Strange Encounters is a book you must have.